It sometimes feels like conservation news is nothing but doom and gloom, so sit back and enjoy a recent success story from New Zealand. The story involves one of the less well known of New Zealand’s species, the Hutton’s Shearwater. 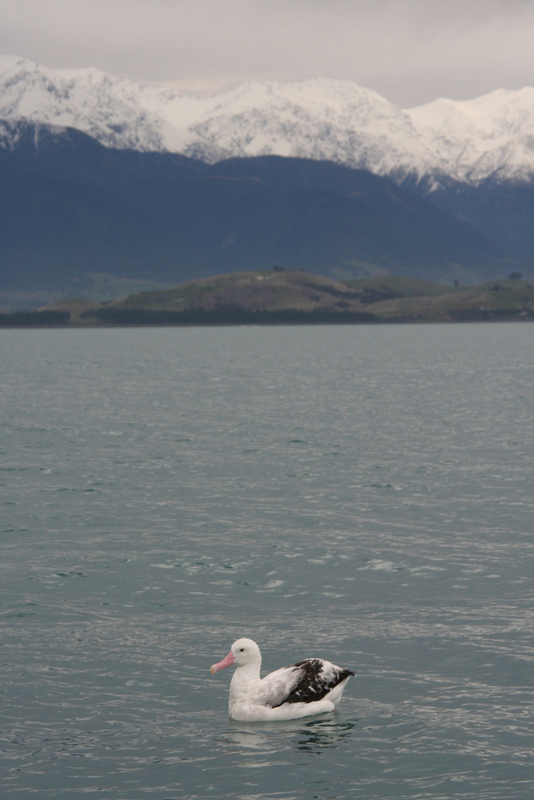 New Zealand has a lot of seabirds, and amongst them a lot of petrels and shearwaters. Some of them are actually familiar birds to non-Kiwis, as millions of Buller’s Shearwaters and Sooty Shearwaters leave New Zealand each year and fly up to the waters off Alaska and California. In total there are 34 species of procellariid (shearwater, petrel, fulmar and prion) breeding in New Zealand, almost half the world’s number of species. Like shearwaters everywhere, the Hutton’s Shearwater nests in sites that were free of predators. Shearwaters are vulnerable on land to predators, so their colonies historically were placed in sites predators couldn’t reach. The nesting sites of the Hutton’s Shearwater are somewhat unusual in that instead of being on offshore islands they are not only on the mainland of New Zealand but are found high in the mountains of the Kaikoura Seaward Range. 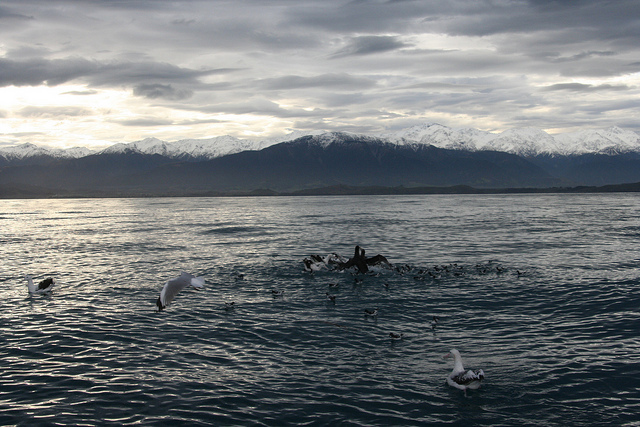 Kaikoura is New Zealand’s premier marine wildlife tourist destination. It is located on the east coast of South Island on the road between the ferry terminal at Picton and Christchurch. People go to Kaikoura to swim with the massive pods of dolphins or groups of fur seals, to watch whales and seabirds, or to dive. I’ll be doing a post about the simply astonishing seawatching possible at Kaikoura at some time in the future, but he’s a little taster. 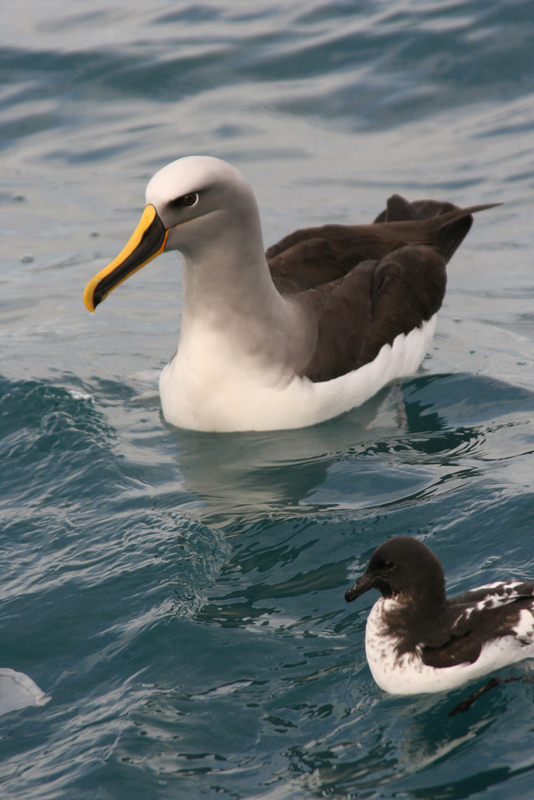 Buller’s Albatross (Thalassarche bulleri) and Cape Petrel (Daption capense) at Kaikoura. Image Credit: Duncan Wright. Kaikoura itself is on a slight peninsula sticking out to sea. Close to the town, and the sea, the Kaikoura Ranges rear up to the sky. From the main street of Kaikoura they dominate the view north; and they are clearly visible from the beach as far away as Wellington. They are tall enough that when I saw them last Wednesday, in what is supposed to be spring, they still had a considerable amount of snow on them. The Hutton’s Shearwater may have once bred on the Inward Kaikoura Ranges, but today is restricted to the Seawards. After breeding they fly around Australia to spend the winter off the coast of Western Australia. The breeding colonies of this species were not discovered until 1964, at which time eight colonies were found. By 2005 those eight colonies had dropped to just two. The largest colony at Kowhai River numbers around 100,000 birds, and the smaller colony at Shearwater Stream has a much smaller 8,000 birds. The Kaikoura Ranges (back), Kaikoura Peninsula (middle) and gratuitous albatross photo for Corey (albatrosses, giant petrels, Cape Petrels and gulls) Image Credit: Duncan Wright. So what was happening to the species? The problem is, like it is for so many New Zealand species, introduced species. As I mentioned earlier, shearwaters are vulnerable to introduced predators. Hutton’s Shearwaters used to nests on the mainland because once New Zealand used to be a very large island and had no native mammalian predators. And the location of the colonies, high in the mountains, reduced the potential number of avian predators. But thanks to humans there are now numerous predators on South Island. Stoats are the most damaging species, with chicks being the most commonly taken. They are also vulnerable because introduced goats (including the Chamois from the European Alps) denude vegetation cover where the colonies are located, causing landslips. Just as New Zealand’s birds are unable to cope with introduced predators, New Zealand’s plants have evolved to cope with avian browsers like moa and giant geese, and are unable to cope with the introduced ungulates. Goats also cause the death of incubating adults by collapsing burrows. Another species of shearwater, the Scarlett’s Shearwater, nested on the mainland of New Zealand and went extinct due to introduced rats. In order to protect the Hutton’s Shearwater it is therefore necessary to control the introduced species that threaten it. Trapping of stoats, and controlling the numbers of goats and pigs in the vicinity of the colonies have been ongoing. In spite of the difficulties of working in a remote and hard to reach part of the mountains these efforts have met with some success. The 2009-2010 breeding season a combination of stoat trapping and a good year for their marine prey resulted in a 81% breeding success rate. Bitter experience has taught New Zealand conservationists the danger of keeping too many eggs in one basket. Single populations are vulnerable to disaster, and the two remaining Hutton’s Colonies were in difficult to protect locations. So it was decided to create a third colony in an easier to protect location, the Kaikoura Peninsula. Chicks close to fledging age were moved from the mountain colonies and placed in artificial burrows on land on the peninsula in a project run by the Department of Conservation, in collaboration with local businesses, landowners and the local Maori iwi. Procellariids are highly philopatric and will return to the colony of their birth in order to breed, so to establish a new colony chicks have to imprint on the colony they fledge from. The work began in 2005, since when 300 chicks have been moved to the peninsula. In spite of trapping to control predators some chicks were lost to cats, so in 2008 the Hutton’s Shearwater Charitable Trust was founded with the goal of securing the colony with a predator-proof fence. Such fences have been instrumental in creating so-called mainland islands like the Karori Wildlife Sanctuary in Wellington. This fence, enclosing 2.1 ha area, was completed in February of this year, and a programme to remove any mammals was undertaken from May through June. 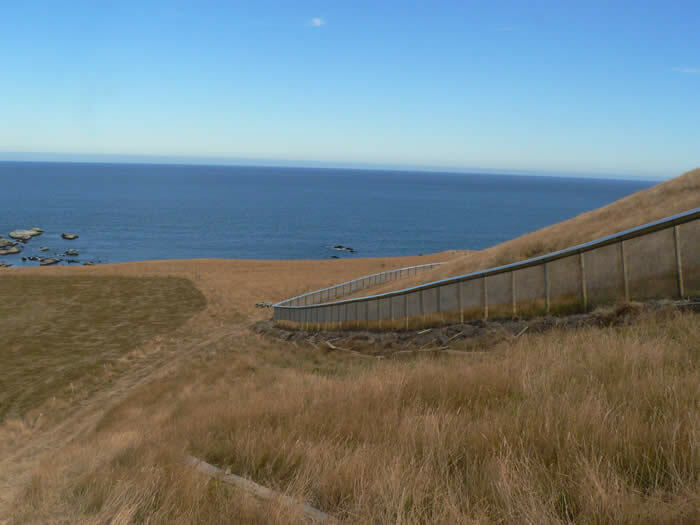 Predator-proof fence at Kaikoura Colony. 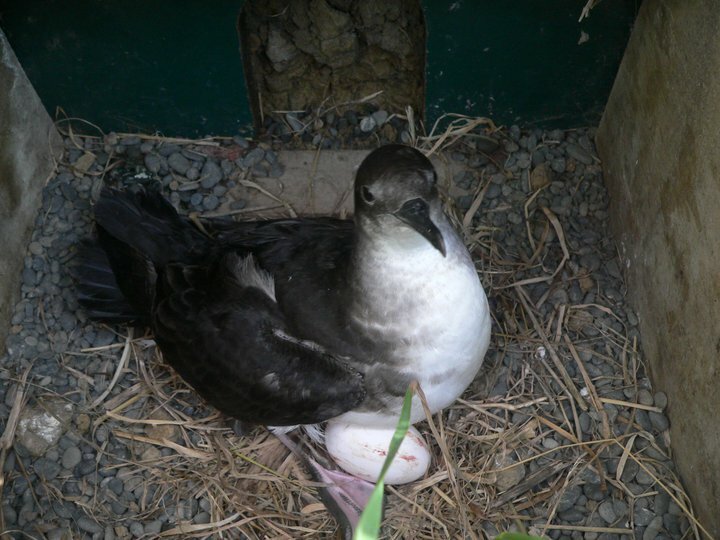 Image credit: Hutton’s Shearwater Charitable Trust. 2010 had one further milestone in the project still to come however. Young birds have been returning to the colony for a while, but shearwaters, like all other petrels and albatrosses, have long lives and do not usually breed for a number of years after fledging. It was not expected that the Hutton’s Shearwaters at Kaikoura would begin breeding for at least another two years, but last Friday a routine check of the nesting boxes found a three and a half year old bird with a freshly laid egg! Proud parent with the historic egg. Image credit: Lindsay Rowe, Hutton’s Shearwater Trust. There is still a way to go to completely secure the future of the Hutton’s Shearwater, but amazing progress has been made. So far the Hutton Shearwater Trust has managed to raise NZ$ 350,000 to construct the fence, manage the colony and undertake research in the other colonies. With the support of local groups and the Department of Conservation, the future of this species is looking increasingly rosy. “The Hutton’s Shearwater Charitable Trust was formed in October 2008 to: encourage and promote the preservation, conservation, research, public education, and sustainable management of the Hutton’s shearwater. And you are really going to have to stop with the albatross pictures or you are going to end up with a colony of Coreyus birderus (an ineradicable invasive species) on your couch. @ Corey – I won’t be silenced! Albies are awesome! Fortunately we do have a fold down futon couch that I am told is very comfortable. Incidentally, there are five bonus 10,000 Birds points to anyone that read the headline in the voice of Professor Farnsworth. Introduced species are affecting native populations all over the world! Unfortunately, sea birds are most affected (e.g. Faulkland Islands, Scotland). How do we completely eradicate these pests?? Especially in places where the money isn’t being thrown at the problem (e.g. Galapagos Islands). Actually, the Kiwis are getting very good at eradicating pests, and export their expertise. But yeah, the only way to do it is to spend money on poison (for rats and the like) or marksmen (for pigs, cats and goats).